New Delhi: Sir Ganga Ram Trust Society, Board of Management, Consultants and Staff of Sir Ganga Ram Hospital (SGRH) during the weekend celebrated its 64th Founder’s Day on 13th April ‘ 2019. On this occasion, Shri Anil Baijal, Hon’ble Lieutenant Governor, NCT of Delhi was the Chief Guest. The celebrations started today morning by garlanding the statue of Sir Ganga Ram. Later in the day, Shri Anil Baijal distributed Meritorious and Long Service awards to staff and doctors of the hospital. A cultural programme was presented by students of the School of Nursing. 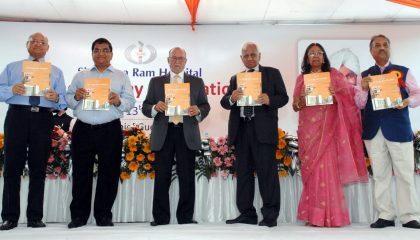 On this occasion, Dr D.S.Rana, Chairman, Board of Management, Sir Ganga Ram Hospital read the Hospital Report and Shri Ashok Chandra, Chairman, Sir Ganga Ram Trust Society welcomed the guests. Mrs Sujata Sharma, Honorary Secretary, Sir Ganga Ram Trust Society paid tributes to Sir Ganga Ram (1851-1927). Sir Ganga Ram was an engineer by profession who was born on 13th April 1851 at a village Mangtanwala of Punjab Province in British India, in present-day Pakistan. He graduated from Thompson College of Civil Engineering in 1873. In 1921, he established Sir Ganga Ram Hospital in Lahore which still functions by the same name and is a 500 bedded hospital attached to Fatima Jinnah Medical College. He expired on 10th of July 1927 in London. Sir Ganga Ram Hospital in Delhi was inaugurated in 1954 by then Prime Minister of India, Pandit Jawahar Lal Nehru and is today 800 bedded multi-speciality, tertiary care hospital.